Last week, I wrote about a strange issue Shadow of Mordor players have been reporting since the game came out: Orcs they insisted they'd killed kept coming back from the dead. Developer Monolith has now told me that while they're aware of people's confusion, they're also having a hard time testing for a solution. 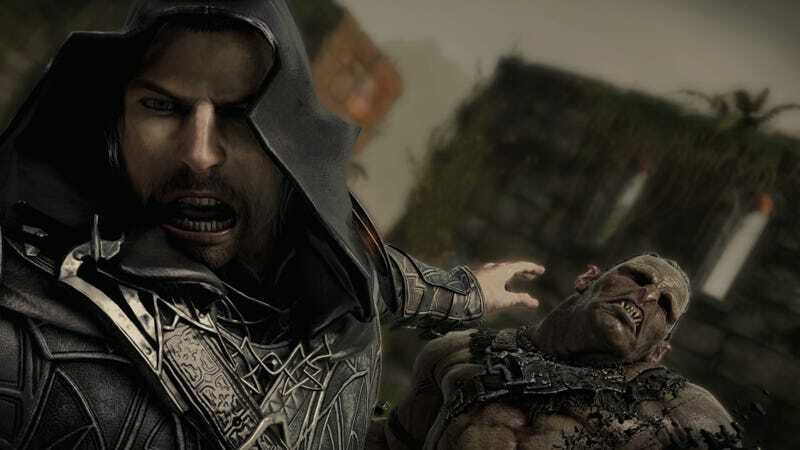 To refresh all our memories quickly: much of Shadow of Mordor's gameplay revolves around ongoing and constantly-evolving rivalrous relationships between player character Talion and the world's colorful cast of orcs and uruks. These bad guys level up and respond to the various ways you've either managed to defeat them, or they've defeated you, in combat. The point where players started to get confused had to do with what happens sometimes when Talion defeats a nemesis orc. Sometimes, these guys would show up in Mordor again to challenge him anew. I keep saying sometimes, because this wouldn't always happen. This orc revival system is an intentional feature, in part. But as I outlined in my original tips post, Monolith said that there were certain types of attacks, and executions specifically, that were supposed to guarantee an orc would end up dead at the end of a fight. And stay that way. Once Shadow of Mordor came out, players started to tell me this wasn't always working out the way Monolith said it was supposed to. In the statement the studio provided me with today, the developers revisited their explanation for how the nemesis system works with regards to orcs surviving fights they've technically lost. Interestingly, they then added that while they've "received player reports of decapitated orcs returning from death," they haven't been able to "recreate an instance of a decapitated orc surviving." The Nemesis System is designed to allow for orcs to survive tough encounters, despite the player having defeated them in battle. Players may see captains or warchiefs who appeared to have been killed return with battle scars specific to their last encounter. For example, an orc who was slain by a headshot from an arrow may return with a metal eyepatch indicating he's lost an eye; or an orc who was burned in a fire may return with burn scar-tissue on his face; or an orc stabbed in the head may be covered in bandages. The only way to ensure an orc does not return is to decapitate him in battle, which occurs using certain combination moves. If an orc is not decapitated, despite having the appearance of being killed, he may survive the fight and return to battle later on in the game. The Monolith team has received player reports of decapitated orcs returning from death but in internal testing have yet to be able to recreate an instance of a decapitated orc surviving. Me: Regarding the nemesis system, do orcs only change their appearance/dialogue but still reappear if they SURVIVE a fight but still lose? Or do they ever come back to life (so to speak) to fight again the same way Talion does? I have one orc that I thought I killed but he's showed up to challenge me a few times since then, so I want to check if that's actually a possibility. Dominating him and selecting "Kill"
Not being able to recreate the problem could mean a few different things, in my view. One, Monolith might not be able to identify what's causing orcs to come back from the dead yet. Or, two (and these aren't necessarily mutually exclusive): not being able to replicate the problem means that they're not able to fully appreciate and understand it yet, and thus arrive at a proper solution. I guess that leaves a third option: that the developers aren't convinced there is a problem in the first place. Which is valid, considering that I and many other players have acknowledged that Mordor is an incredibly fun game, orc-killing confusion aside. Also, and this might just be excessive nitpicking on my part, but I did notice that Monolith referenced "certain combination moves" in its new statement, rather than identifying the specific ones they'd previously mentioned in the original pre-release statement. Since players are also confused about how to perform proper executions, exactly, I asked if there were any moves that guaranteed a legitimate, orc-killing, true-death-achieving decapitation, and if Monolith's new statement is meant to acknowledge that the original ones they'd detailed aren't working as effectively as people would've liked. I'll update this story if and when I hear back from the studio with additional information. Awesome lead image comes courtesy of Reddit user Matrix8967, who's clearly already putting Mordor's new photo mode to good use. See more of his shots here.